People are switching from Pay TV VOD to broadcaster TV Everywhere apps. As well, LG is putting the smarts into TV with AI. We discuss some of the new things we heard at the TV of Tomorrow on December 4th, 2018. For example, TruTV sees people moving from the pay TV experience to the company’s TV Everywhere app. A CuriosityStream executive talked about how the company as radically changed their business model. Social TV experts struggle to define premium video. 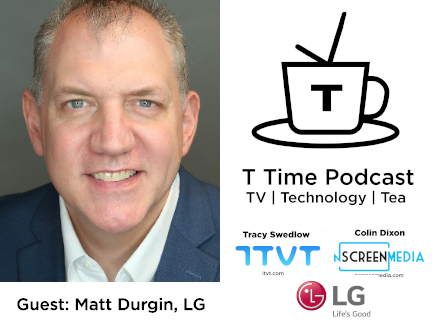 Matthew Durgin, Director of Content Partnerships, North America, joined us to discuss what’s happening with smart TVs in general, and LG smart TVs specifically. He reveals that LG smart TVs have just won an award from Tom’s Guide. Matthew discusses how the company uses AI to make its smart TVs easy to use by consumers. Streaming media players like Roku and Apple TV are blunting the smart TVs value proposition to consumers. Or are they? Matthew doesn’t see it that way. A new trend in smart TVs is to provide free linear TV channels without pay TV or an antenna. Matthew talks about how LG is providing hundreds of channels of free ad-supported streamed TV. At the TV of Tomorrow Show, there was lots of discussion about ATSC 3.0. However, without televisions that support it, the new TV technology cannot make any progress. Matthew talks about LG’s plans. Where are smart TVs headed in 2019? Matthew says wireless speakers and WebOS upgrades are on the agenda. So are new, beautiful screens that can be rolled, twisted, and shaped.